How many times have you wanted to break a bad habit and time after time you end up sabotaging your efforts? Some people may give up cold turkey on one habit, yet they end up picking up another one to compensate. Or they may have a part of themselves that they do not like, they work on it, and another part that they dislike and hadn’t noticed before shows up in their persona. This is a visualization exercise that you can do with your eyes open. With a little practice, it takes a minute or two to move from beginning to end. It will also provide you a template to use as conflict resolution and forging mutually beneficial agreements with others. If you have studied NLP before, this is one of my interpretations of Six Step Reframe Technique. Sit down and extend your arms in front of you and open your hand’s palms up. Invite the problem side to stand in one hand and the creative side of you on the other hand. Ask the old behavior part, what positive outcome or intention it has for you (e.g. a smoker “part’ may say that smoking helps the individual wind down and relax). In this step, we are separating the problem behavior from the positive intention of the part responsible for the old behavior. Now invite the creative side to come up with at least three new behaviors that will accomplish the positive intent of the part responsible for the bad habit. Once you have those new choices do an ecological check, find out if there are any parts of you that object to the implementation of the new choices (e.g. if one of the choices is to quit smoking is to eat unhealthily, a part of you will naturally object to the new choice). A new choice that is effective and elegant would be one that feels effortless and organic. 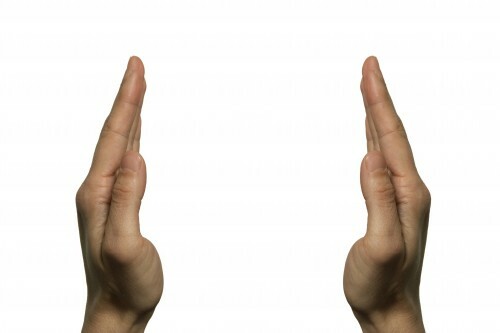 Once both parts (or all parts) have agreed, rotate your left hand 90 degrees to the right and your right hand 90 degrees to the left, so your palms are facing each other. Concentrate in the space in between both palms and repeat this mantra, “integrate these new choices fully and completely now”, and as you do so, see your palms getting closer and closer until they touch and become one. This exercise can be mixed in many ways. You might invite one part to represent your mind and one part to represent your body. One hand may have a part of you that you like and the other hand a part that you dislike. One hand may have a part from the past and the other a part from the future, or a judging part and a forgiving part. In any of these situations, you would ask each part to give you their positive intention. Once you have all the positive intentions from each side, then rotate your hands again and imagine both hands coming together as one as both parts “talk to each other” until they find a place of cooperation, so in the future, they can work together.